We have ants in our laundry room. I didn’t notice until I had pushed the big pile-o-towels over to the washing machine to do a hot wash. I picked up a facecloth and noticed there was black fluff on it. Then the black fluff MOVED. I had inadvertently squished a whole train of ants when I moved the towels. So I had to shake out all the towels before I put it them the washing machine. About a dozen stunned and confused ants dropped to the floor. 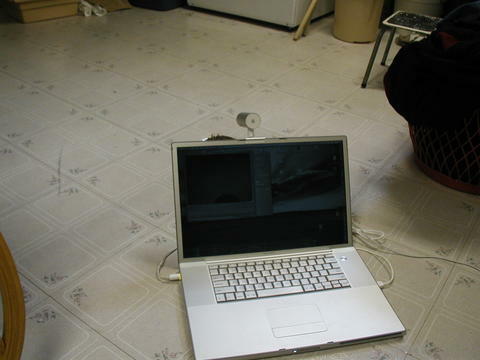 So I have laid down several drops of our AntBeGone stuff, but I can’t remember if it works very well or not. I then had a thought that I should find out more about where they are going. 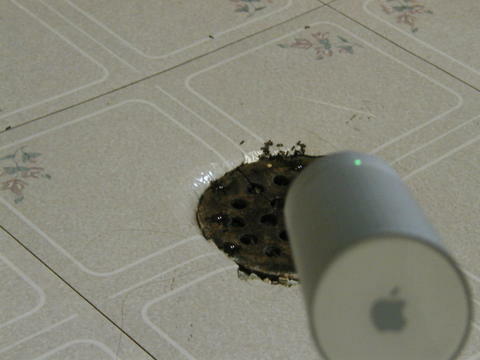 The iSight keeps an eye on the ants clustered around the drain. I’m hoping it will be easier to figure out where the ants come from and go to if we see them move much faster. ← If you read only one movie plot summary..
Well, I should have done some recording *before* I put down the poison, because all they did was swarm the poison and stay around the drain. As for stock values, ya, over the last 3 months they’re doing *almost* as badly as Amazon, and a bit worse than Google. Tech stocks are not where it’s been at in the past quarter..